Creativity, Technology & Teacher Education . Published 2016 . Publisher: Association for the Advancement of Computing in Education (AACE). 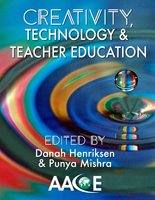 This book focuses on research related to creativity, technology and teacher education, examining these topics through a range of approaches and ideas across multiple contexts. The volume itself began as a special issue of the Journal of Technology & Teacher Education. The chapters in this book speak to different aspects of theory, research, and practice – in attempts to go beyond the specifics or intricacies of tools, and towards a broader framework. This provides guiding ideas and takeaways that can inform the future of teacher education. One of the strengths of this volume is the rich manner in which these ideas are explored across different subject matters, classroom and learning contexts, technologies, teacher roles, pedagogical approaches, and theoretical frameworks. Henriksen, D. & Mishra, P. (Eds.). (2016). Creativity, Technology & Teacher Education . Association for the Advancement of Computing in Education (AACE). Retrieved April 25, 2019 from https://www.learntechlib.org/primary/p/172823/. Getzels, J.W., & Csikszentmihalyi, M. (1976). The creative vision: A longitudi-. New York: Wiley. Glaser, B.G. & Strauss, A.L. (1967). The discovery of grounded theory: Strate-gies for qualitative research. Chicago, IL: Aldine. Hutchins, E. (1995). Cognition in the wild. Cambridge, MA: MIT Press. Ito, M., Baumer, S., Bittanti, M., et al. (2010). Hanging out, messing around, and geeking out: Kids living and learning with new media. Cambridge, MA: MIT Press. Design Studies, 12(1), 3-11. Kafai, Y.B., Peppler, K., Chapman, R. (Eds.) (2009). The Computer Clubhouse: Creativity and Constructionism in Youth Communities. New York, NY: Teachers College Press. Kafai, Y.B, & Resnick, M. (1996). Constructionism in practice: designing, thinking, and learning in a digital world. Mahwah, N.J.: Lawrence Erlbaum Associates.Mahoney, J., Larson, R., & Eccles, J. (2005). Organized activities as contexts of development. Mahwah, NJ: Erlbaum.Moss, P.A. (2008). Sociocultural implications for assessment I: Classroom as-sessment. In P.A. Moss, D. Pullin, J.P. Gee, E.H. Haertel, & L.J. Young (Eds. ), Assessment, equity, and opportunity to learn (pp. 222-258). New York: Cambridge University Press. Pea, R.D. (1997). Practices of distributed intelligence and designs for education. In G. Salomon (Ed. ), Distributed cognitions (pp. 47-87). New York: Cam-bridge University Press.Peppler, K. (2013). Eagleman, D.M. (2013). Why public dissemination of science matters: A mani-festo. Journal of Neuroscience, 33(30), 12147-12149. Edelson, D.C. (2009). Geography and ‚Generation G™. Education Week, 28(19), 24-25.Einstein, A., & Infeld, L. (1938). The evolution of physics. New York: Simon and Schuster. Esquivel, G. (1995). Teacher behaviors that foster creativity. Educational Psy-chology Review, 7(2), 185Œ202.Gardner, H. (2011). Creating minds (2nd ed.). New York, NY: Basic Books.\x0cFostering Creativity through Inquiry and Adventure 135Glaser, B.G., & Strauss, A.L. (1967). The discovery of grounded theory: Strate-gies for qualitative research. Chicago: Aldine Pub. Co.
Hart, P., & Nisbet, E.C. (2012). Boomerang effects in science communication: How motivated reasoning and identity cues amplify opinion polarization about climate mitigation policies. Communication Research, 39(6), 701-723.Hayes-Bohanan, J. (2011, July 25). Geo-STEM. Wiley Hot Topics. Retrieved from http://wileygeohottopics.com/2011/07/25/geo-stem/. Heffron , S.G., & Downs, R.M., Eds. (2012). Alibali, M.W. (2013). Building cohesion across representations: A mecha-nism for STEM integration. Journal of Engineering Education, 102(1), 77-116.